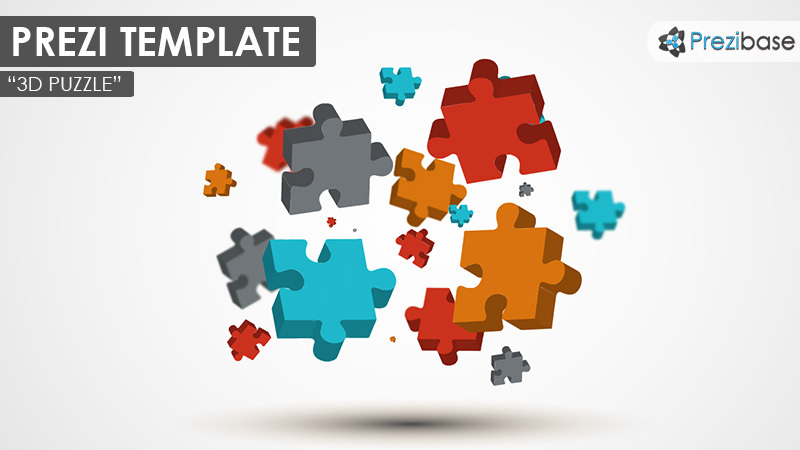 Prezi Presentation Template with 3D jigsaw puzzle pieces scattered on a gray gradient background. Effective 3D transitions while moving from slide to slide. Colors included: red, blue/cyan, orange, dark gray. Create an abstract, simple and yet creative presentation by zooming into the puzzle pieces. Talk about mind-puzzling topics, mysteries, good for presenting to kids. Suitable for various presentations topic including educational, entertainment and presenting for kids. Present a quiz, ask questions, show answers or play a trivia game. Present solutions to complicated problems. This entry was posted in Best Prezi presentation templates and tagged 3d, 3d presentation, 3d puzzle prezi, 3d space ppt, 3d transitions prezi, advertising, answers, blue, blur, business, color, colorful, colors, depth of field, gray, ideas, jigsaw, minimal, mystery, perspective, presentation 3d dimensions, prezi template, prezi templates, problems, puzzle, questions, quiz, red, shapes, simple, trivia.